Located in historic downtown Redmond, Redmond’s Bar & Grill is a purveyor of fine American dining from our esteemed Chef Chris Nelson. Photos by Lara Dattilo and Tim Short. Redmond’s Bar & Grill is located at the corner of Redmond Way and Leary Way at the heart of the historic downtown Redmond core. Since opening in September of 2011, Chef Chris Nelson has been serving both quality interpretations of classic dishes as well as modern plates that embrace current trends. 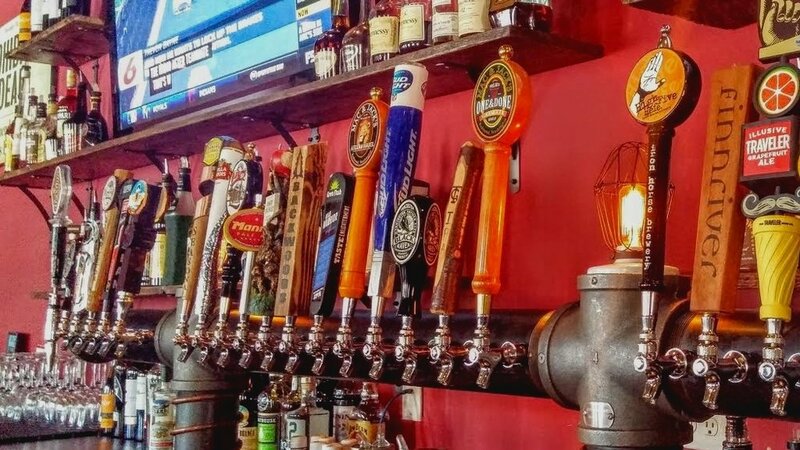 In addition we offer a full bar, craft cocktails, and 24 beers on tap comprised of many craft and local brands. We are located in one of the few historic buildings in the city of Redmond. Our building was constructed in 1903 and was the city’s first community and entertainment hall, as well as it’s first theater. The staff and management of Redmond’s Bar & Grill look to carry on it’s rich tradition and history by ensuring our establishment is a place for the community to gather for years to come. For more on our building’s history click here. Togarashi-sesame seed crusted seared ahi, avocado, wasabi cream, and mango. Organic greens, taro root confetti with soy ginger vinaigrette. Chickpeas, garlic, olive oil, sun dried tomatoes, pine nuts, green olives, pita, carrots, celery, and cucumbers. Steamed and tossed in Redmond’s seasoning. Strawberries, apples, grapes with artisan cheeses: Beecher’s White Cheddar, Manchego, Stilton, Chèvre, and Brie with Rosemary Croccantini crackers. Grilled chicken, peanut sauce, and cilantro vinaigrette. Chèvre and cream cheese filled jalapeños wrapped in bacon. Served with apple onion jam. Spinach, Parmesan, artichoke hearts, and tortilla chips. Shredded pork, shiitake mushrooms, water chestnuts, ginger, and mushroom soy. Served with Jasmine rice, sambal oelek, plum sauce, and lettuce leaves. Wings and drumettes in buffalo sauce with celery and bleu cheese. Corn tortillas, carne asada marinated hanger steak, guacamole, pico de gallo, cotija cheese, radish, and house-made spicy serrano salsa served on the side. Ahi poke, cucumber, carrot, green onion, ginger, and avocado in a tempura crust. Topped with roasted sesame seeds, mango puree, and Sriracha aioli. Bacon, sugar in the raw and Cajun spices. Thai peanut sauce, grilled chicken, cabbage, basil, carrots, onions, cilantro, mozzarella, and Sriracha. Italian sausage, Beecher's White Cheddar, red sauce, mushrooms, and mozzarella. Roasted garlic, mozzarella duo, sun dried tomatoes, and fresh basil. Pork carnitas, barbecue sauce, avocado, jalapeños, cheddar-jack cheese, and pickled onions. Cucumbers, grapes, carrots, cotija, organic mixed greens, with Redmond's white balsamic basil vinaigrette. Buffalo chicken, ranch dressing, bleu cheese crumbles, egg, tomato, romaine hearts, and green onions. Togarashi sesame seared ahi, organic mixed greens, avocado, diced mango, pickled cucumbers, and taro root confetti, with soy ginger dressing. Organic mixed greens, blueberry pomegranate vinaigrette, lemon herb chicken, avocado, tomato, hard boiled egg, bleu cheese, and bacon crumbles. Grilled chicken, candied walnuts, mango passion fruit ginger dressing, apples, avocado, pickled cucumber, mandarin oranges, grapes, and romaine hearts. Grilled to order Hanger steak, herb roasted fingerlings, cotija, sun dried tomatoes, over grilled hearts of romaine with Redmond’s white balsamic vinaigrette. Clams, red potatoes, carrots, celery, and cream. Topped with smoked Sockeye salmon and bacon crumbles. Served weekdays only. Ask your server for details. Bacon, fried egg, Redmond’s cheese sauce, crispy onions, buffalo sauce, tomato, lettuce, and roasted garlic mayo on a pretzel bun. Bleu cheese crumbles, Creole spices, tomato, lettuce, onion, and roasted garlic mayo on a pretzel bun. Redmond's seasoning, tomato, lettuce, onion, and roasted garlic mayo on a pretzel bun. Grilled chicken breast, Brie, apple-onion jam, tomato, lettuce, and roasted garlic mayo on a brioche bun. Cajun candied bacon, peanut butter, Redmond's seasoning, tomato, lettuce, onion, and roasted garlic mayo on a pretzel bun. Grilled chicken breast, tomato, lettuce, onion, and roasted garlic mayo on a brioche bun. Wild Sockeye salmon, tzatziki, tomato, lettuce, onion, and roasted garlic mayo on a pretzel bun. Grilled pasilla peppers, pepper jack cheese, pork carnitas, pico de gallo, guacamole, lettuce, and roasted garlic mayo on a pretzel bun. Burgers served with your choice of Redmond’s house cut fries, garlic Parmesan herb fries or quinoa salad. LOOKING FOR A VEGGIE OPTION? Sub a veggie patty on any burger, no charge! Hand breaded Alaskan cod in Mac & Jacks panko crust, chipotle lime aioli, pico de gallo, cabbage, and cotija in artisan-corn tortillas. Choice of house cut fries or garlic Parmesan herb fries. Corn flake crusted chicken breast, mozzarella, marinara, and seasonal vegetables. Choice of garlic mashed potatoes or herb roasted fingerlings. House-smoked pastrami, Swiss, Thousand Island, and sauerkraut on toasted rye. Choice of house cut fries or garlic Parmesan herb fries. Hand breaded Alaskan cod in Mac & Jacks panko crust, Choice of house cut fries or garlic Parmesan herb fries. Turkey breast, avocado, bacon, tomato, lettuce, onion, and garlic mayo on toasted honey whole wheat. Choice of house cut fries or garlic Parmesan herb fries. Grilled lemon thyme chicken, tomato, lettuce, cotija, onion, and tzatziki in a warm pita. Choice of house cut fries, or garlic Parmesan herb fries. 7oz Filet grilled to order, Cabernet demi-glaze, and seasonal vegetables. Choice of garlic mashed potatoes or herb roasted fingerlings. Marinated, grilled to order, with Cabernet demi-glaze, Gorgonzola, and seasonal vegetables. Choice of garlic mashed potatoes or herb roasted fingerlings. Wild Sockeye with raspberry Chambord-tarragon butter and seasonal vegetables. Choice of garlic mashed potatoes or herb roasted fingerlings. Thin sliced seared prime rib, smoked onions, and Swiss on a French roll with au jus. Choice of house cut fries or garlic Parmesan herb fries. Elbow pasta in Redmond’s Cheese Sauce, with truffle oil, Beecher’s white cheddar, roasted bread crumbs, prosciutto bacon, fresh herbs, and apple wedges. House-smoked pastrami, candied bacon, pepper jack cheese, with chipotle lime coleslaw on a brioche bun. Choice of house cut fries or garlic Parmesan herb fries. GLUTEN AND DAIRY FRIENDLY OPTIONS AVAILABLE Ask your server for details. Poached eggs over toasted English muffin with black forest ham, Hollandaise sauce, and Redmond’s almost famous breakfast potatoes. Three-egg scramble with Italian sausage, mozzarella, spinach, sun dried tomatoes, mushrooms, and Redmond’s almost famous breakfast potatoes with choice of toast. Three-egg scramble with Crimini mushrooms, tomatoes, cheddar- jack cheese, caramelized onions, Redmond’s almost famous breakfast potatoes, and choice of toast. Poached eggs over toasted English muffin with arugula, tomato, Hollandaise sauce, and Redmond’s almost famous breakfast potatoes. Three-egg omelet with black forest ham, cheddar-jack cheese, and Redmond’s almost famous breakfast potatoes with choice of toast. Three-egg omelet with spinach, bacon, Swiss, and Redmond’s almost famous breakfast potatoes with choice of toast. Three-egg omelet with spinach, mushrooms, peppers, onions, cheddar-jack cheese, and Redmond’s almost famous breakfast potatoes with choice of toast. Two eggs cooked your way, bacon or sausage, and Redmond’s almost famous breakfast potatoes with choice of toast. Two eggs cooked your way, corn tortillas, black beans, ranchero sauce, sour cream, avocado, and Redmond’s almost famous breakfast potatoes. Poached eggs and chipotle hollandaise over potatoes, house-smoked pastrami, peppers, and onions. Served with gazpacho tomato salad. Three-egg scramble with andouille sausage, Chèvre, onions, peppers, and Redmond’s almost famous breakfast potatoes with choice of toast. Flour tortilla filled with sausage, eggs, bacon, cheddar-jack cheese and green onions. Topped with ranchero sauce. Served with pico de gallo, sour cream, guacamole, and Redmond’s almost famous breakfast potatoes. Texas toast dipped in vanilla cinnamon egg custard and grilled. Choice of bacon or sausage. Texas toast dipped in vanilla cinnamon egg custard, grilled, and stuffed with your choice of raspberry jam and brie or Nutella and bananas. Choice of bacon or sausage. Two eggs cooked your way, buttermilk crust tender cube steak cutlet, with country gravy and Redmond’s almost famous breakfast potatoes. House-made granola with almonds, cranberries, chia seeds, pumpkin seeds, sunflower and hemp seeds, whole grain oats, coconut oil, and organic maple syrup. Milk served on the side. Vanilla yogurt, layered with house-made granola, bananas, and strawberries. KIDS MEALS COME WITH CHOICE OF FOUNTAIN DRINK. Vanilla ice cream and chocolate sauce. Sprite, Fanta, Lemonade, Coke, Diet Coke, Orange, Mr. Pibb or Shirley Temple. Milk, chocolate milk, orange, apple, pineapple, cranberry or grapefruit. Two eggs scrambled served with bacon or sausage, Redmond’s almost famous breakfast potatoes and choice of toast. Texas toast dipped in vanilla cinnamon egg custard, grilled, and served with maple syrup and butter, topped with powdered sugar. Served with choice of bacon or sausage. Two-egg omelet with country ham and cheddar-jack cheese. Served with Redmond’s almost famous breakfast potatoes and choice of toast. Redmond’s Bar & Grill offers full catering services to the greater Seattle area. From custom catering platters for pick up to large scale, full service events, RBG Catering has you covered! Let us craft a proposal for your next business lunch, home gathering, office party, auction, fundraiser, or any event you can imagine! Menus: While our catering menu is extensive, we are always open to new ideas. If there is something you’d like us to serve that you don’t see on our menu, don’t hesitate to ask! In the meantime, check out some of our fan-favorite selections below. FAQ’s: We’ve been providing catering services to the Redmond area & beyond for over 7 years - can you believe it? Here are some of the most common questions we've answered over the years. Events: From boxed lunch deliveries to buffets laid for hundreds, if you name it - we’ve catered it. Our catering contract and Sample Itinerary & Menu can give you a better idea of how we like to do things, while we’re getting acquainted with what you’d like to have done! Reservations: Whether you’re making plans for one, five or ninety-five, we’ve got you! Take a virtual tour of our dining room, bar and recreation areas (shuffleboard & pool tables included)! Parties of 1-6: Don’t be shy, book online! Parties of 7-15: Give us a ring and we’ll book your shindig! Any questions you couldn’t find the answers to in our House Rules can be clarified live with an RBG staffer. Parties of 40+ should peruse through our private rental agreement if you’re interested in having us all to yourself! Private Rentals: Our back area can accommodate parties as large as 40, with minimums as low as $500.00 Sunday-Thursday, and $1,000.00 Fridays & Saturdays! Check out our large party setup for a bird’s-eye-view of what we can do. Please call us at: 425-558-9800 Option 5 for large parties and special requests. CLICK HERE TO PURCHASE AN RBG GIFT CARD!